Visiting the Colosseum - The Colosseum or Coliseum was originally known as the Flavian Amphitheatre is an oval shaped amphitheatre in the centre of Rome and is the largest ever built in the Roman Empire. It is considered one of the greatest works of Roman architecture and Roman engineering. Standing at 187 feet high and with 80 entrances in ncient Roman times holding upto 80,000 spectators for the games. Situated to the east of the Roman Forum, its construction started in 72 AD under the emperor Vespasian and was completed in 80 AD under Titus, with further modifications being made during Domitian's reign (81–96). The name "Amphitheatrum Flavium" derives from both Vespasian's and Titus's family name (Flavius, from the gens Flavia). The Colosseum was used for gladiatorial contests and public spectacles such as mock sea battles, animal hunts, executions, re-enactments of famous battles, and dramas based on Classical mythology. Although in the 21st century it stays partially ruined because of damage caused by devastating earthquakes and stone-robbers, the Colosseum is an iconic symbol of Imperial Rome. It is one of Rome's most popular tourist attractions and still has close connections with the Roman Catholic Church, as each Good Friday the Pope leads a torchlit "Way of the Cross" procession that starts in the area around the Colosseum. Visiting the Colosseum - this great Ampitheatre definately has to right up there at the top of the list of things to see in Rome. It is extremely central in the city of Rome and has the Metro Line B (Colosseo) which stops right outside. Just few hundred yards from Piazza Venezia, and close to the Roman Forum. A taxi stop is also available right next to the monument. On the 30th July 2013 the City implemented a private traffic ban passing the Colosseum so now the only traffic to pass by are taxi's, public buses, pedestrians and cyclists bringing an end congestion and a definatley more peaceful visit down the Fori imperiali. Bus lines 60, 75, 85, 87, 271, 571, 175, 186, 810, 850, C3, and the electric minibus 117. The picture below shows the locations of the services inside and around. The ticket includes Colosseum, Roman Forum and Palatine Hill and has a validity of 2 days in which you can enter each archaeological site once. FREE ENTRANCE for ALL persons under 18 and over 65 years old. - (Minors under the age of 12 must be accompanied by an adult). If you prefer to make your visit to the Colosseum with the aid of a tour guide you can take a 3 hour long Skip the line tour of the Colosseum visiting the Roman Forum and the Capitoline Hill: Prices for a group tour starting from 40,00 Euro's. The interior is made of brick, tufa and marble; little of the marble survives today. The central area, the arena, was covered with a great wooden floor and canvas to make it waterproof. Over this was a layer of sand to absorb blood - in fact "arena" derives from the Latin word for sand. The floor is now exposed down to its underground passages, where beasts and gladiators awaited their fate, and crossed by a modern walkway. The arena was surrounded by a 5m-high wall to protect spectators from attacks by wild beasts. At the top of the wall was the podium, on which the imperial party and other VIPs had their seats. Near the site of the imperial box is a cross, which replaces an earlier one set up to commemorate the Christians who were believed to have been martyred here. Above this was the cavea, or seating area. This was divided into three tiers: the lowest for knights; the middle for wealthy citizens; and the top for the general population. The base of the Colossus statue of Nero, after which the amphitheatre is named, can be seen between the Colosseum and the nearby Temple of Venus and Roma. Among the ruins stand several triumphal arches. Their architecture has become so iconic that it has been imitated all over the world, including the famous one in Paris. Some buildings are still recognizable. One of the oldest is Basilica Aemilia. This huge marble hall provided shelter for various meetings but was destroyed in a fight with the Visigoths. Another important edifice was the Temple of Vesta, the Roman goddess of the hearth and home. There was a school near the temple in Forum Romanum and opposite to it is the Temple of Romulus with its circular plan and large original metallic door. Constructed in the 7th century AD, the Column of Phocas is the youngest part of the forum. Other temples include the Temple of Saturn, the Temple of Vespasian and Titus, and the Temple of Antoninus and Faustina. Jewelry, sculptures and mosaics are displayed in the Antiquitarium. It is thought that Rome has its origins on the Palatine. The Palatine Hill is some 40 meters high with views of the Roman Forum on one side, and the Circus Maximus on the other. The site is now a large open-air museum which tourists can visit during the daytime. The Palatine became the place where the powerful and wealthy retreated to build their homes and relax. Among the ruins on the hill can be found, the Domus Flavia, the Domus Augustana, the Baths of Septimus Severus, and the House of Livia. 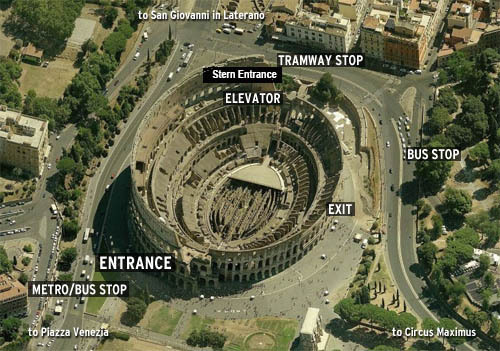 I hope this information helps you on your trip visiting the Colosseum. Thanks for the information, will be booking a tour - hope the weather is good!